Ok, this is more of a rant than a real post but there are times the ’2.0′ moniker just doesn’t work! Stop the madness!! I was in Hallmark this afternoon picking out mother’s day cards and just happened to notice a stand of ‘treasures’ (aka, mostly useless crap). I don’t think I normally would have noticed except there was glitter all over the place so it caught my attention…I guess that marketing ploy worked. 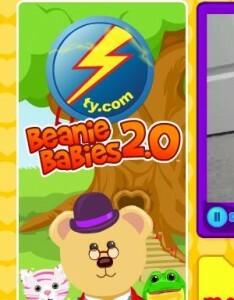 Anyways, I look at the ‘TY’ tag and notice they’ve added ’2.0′ to Beanie Babies. Really?!? You think this is your second coming?!? Adding 2.0 to something doesn’t just make it the new buzzword and give your business a new chance. I’ve heard of business 2.0 and web 2.0 and agree with the new name. I mean, 2.0 in both of these cases means the rules of the game have completely changed. The way business is done and sales are made has changed. The web is now social and it’s getting even more so every day. But how does Beanie Babies 2.0 work? Did you completely change how Beanie Babies function? Didn’t look like it to me…same old fabric animals stuffed with tiny beans. Do they interact with a website? Is this your answer to Webkinz? This sounds like a last-ditch effort to me and I thought it was pretty lame. In a bold move, Google is planning to roll out AdSense for conversations to help you monetize your daily interactions with…well…everyone. 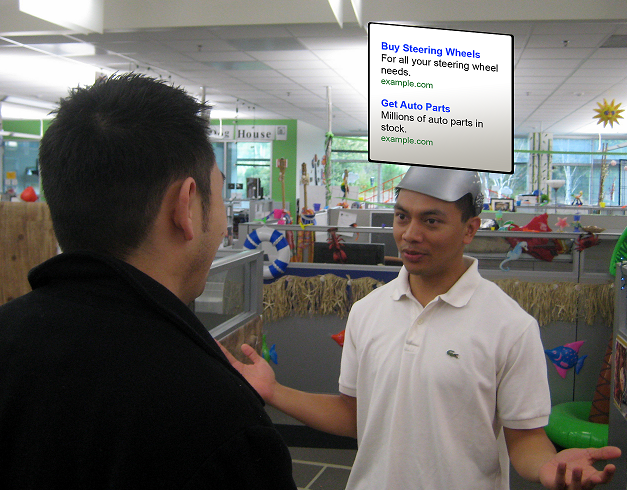 The new AdSense system displays contextual advertising on an “unobtrusive screen” (below) mounted to your head. Apparently, when you sign up for the service they’ll send you an adjustable screen that you can customize. If there aren’t any relevant ads displayed, they suggest repeating yourself or to continue rambling on until the system picks up your conversation. They’ve implemented a pretty neat click process – they transport you directly to the site with their Teleportation Technology. They also mention that you can opt to have the product placed directly in your hands, though they are not clear what kind of setup configuration is required for this. I think AdSense for Conversations is by far the best April Fools joke Google managed today. However, I will admit that I enjoyed the fact that they admitted to using the e-flux capacitor to solve causality issues in Gmail Custom Time. Is Google creating a time machine? I logged into Gmail this evening (let’s be honest, it’s now morning) to do a little work and was greeted by a new link which is not live. Well, it’s visible but it doesn’t navigate anywhere but a 404, page not found. Great, no offense Google but it kind of kills the joke when it’s a dud after I find it. Some of you may remember last year’s Gmail April Fools joke – Gmail Paper. Basically, they offered a free service for you to print all your email and they would send it to you on paper. Where do they come up with this stuff?!? 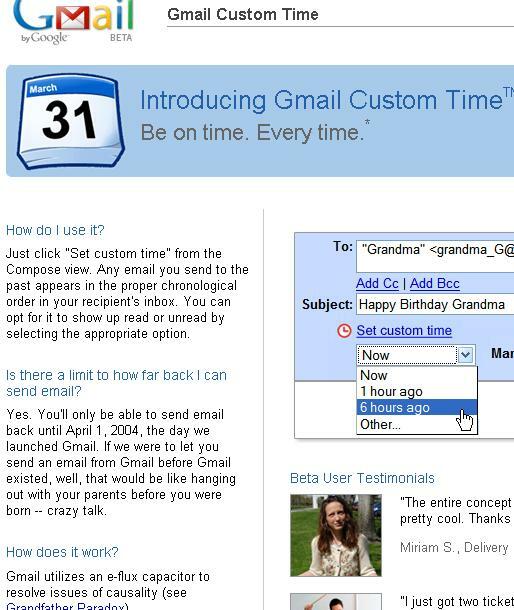 So how will Gmail Custom Time play out? I’m guessing a ‘service’ to let you set times emails will be sent (I can actually see a use for this) or when an email should have been sent. Here’s a shot from my Gmail account. UPDATE: The link in Gmail is now live and it’s pointing to a page with a similar format to last year’s April Fools. The joke this year is a feature that allows you to set the time emails are ‘sent’ as I predicted above. Now I can tell my boss that I sent him that email hours ago even though I didn’t. “Hey boss, refresh your inbox, I know I sent you that TPS report.” Obviously this wouldn’t really work (it’s like printing “hundred of thousands” of emails and having them delivered)…let’s hope they have something else for us when I wake up. I pull up the email and grab the tracking number a couple days later and navigate to usps.com only to find out that it couldn’t provide me an update. It just said that they’ve received the ‘electronic shipping information’. Great, so what does that mean to me…nothing. Anyways, not totally out of it, I decided to sign up for email alerts. According to the descriptions, they’ll email me when the status of my shipment changes. Great, in theory! I go on my merry way only to check it a couple more times, one of them this morning. No change…what is going on with USPS and where is my package?!? Apparently, their system only has a couple statuses – shipping information received and delivered because when I checked my mail this afternoon it had arrived. Surprise, surprise…I didn’t receive the email from USPS until about three hours after the package was actually delivered. Good job guys…I’ll be using UPS or FedEx from now on. As with a large portion of the music listening market I own an iPod and use iTunes to download almost all of my music. It has a great selection, it’s cheap (since I rarely purchase a full cd and pick individual songs instead) and it makes syncing my music extremely easy. 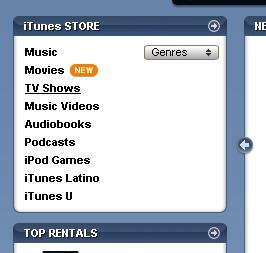 The only downfall I saw with iTunes was the navigation. For me to get more than the top 10 most popular songs I had to navigate to music, and then to the individual genre’s I listen to (I occasionally search the general music top 100 but prefer to filter out the music I won’t buy) . Anyways, when I logged in this evening I found that iTunes has added a quick link section (image below) next to the music navigation link. This allows you to jump directly to the genre of your choice bypassing an entire step. What a simple but effective enhancement! Great job! The only potentially negative impact I see for iTunes is the fact that now I will likely never search the general top 100. I will likely navigate right to the genre’s I purchase and leave it at that. 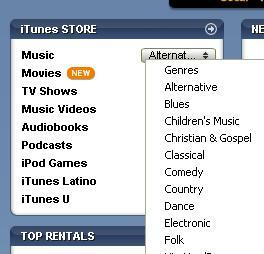 I’ll continue moving down the music longtail by discovering music through iTunes recommendations rather than searching on my own. Well, we’re not really number 1 but I was reviewing some of the blog statistics yesterday and noticed that I’m getting some traffic from Google search results and decided I’d look into the details a bit further. After sorting through some of the specifics I found that if you searched for the words “annoying blocked prank callers” my post Prank callers are annoying is the first search result displayed.